Matcha tea is made from high quality green tea leaves which are stone-ground into a fine, vibrant green powder that is ready to use. With ceremonial-grade matcha, the whole leaf is harvested by hand and used to create a powder that is up to ten times more potent than standard green tea. Matcha has been used for hundreds of years, and it remains a staple of the Japanese diet. We are delighted to provide a carefully selected organic ceremonial-grade, matcha green tea powder, which has an incredibly delicate and naturally sweet taste. Our matcha green tea is packaged in a Miron violet glass container in order to preserve its high nutritional content. What Are the Health Benefits of Matcha Green Tea? Matcha was first discovered 1181 A.D, when the Zen monk, Eisai, brought green tea seeds to Japan and planted them in the temple grounds of Kyoto. He then proceeded to grind the leaves into a powder and used them in tea ceremonies. The word spread, and ritual matcha tea ceremonies became popular all over Asia. Many monks and spiritual seekers honour matcha as it helps to create increased feelings of calm, mental alertness and focused states which are beneficial for a meditation practice. Modern science has revealed that matcha contains a ‘feel-good’ compound called L-theanine, and it’s this amino acid which helps to stimulate alpha brain waves. A Cochrane Review Study shows that regular use of green tea may help to lower blood pressure. Matcha gets its bright emerald-green colour because it contains a high concentration of chlorophyll, plus it’s also rich in antioxidants, fibre, minerals and vitamins A, B-complex, C, E and K. It is commonly enjoyed as a nutritional alternative to coffee. Matcha green tea is graded depending on several factors including the location that it is grown in and the quality of the leaves. Some of the most common grades include kitchen, cooking and culinary-grade matcha, but ceremonial-grade is reserved the highest grade green tea leaves that can be used in matcha tea ceremonies. What is Miron Violet Glass? Miron violet glass containers are able to protect their contents from the harmful effects of UV light. They help to maintain the freshness and nutritional potency of the matcha, and extend its shelf-life. Miron violet glass containers also provide a green way to store this powerful green powder, as they are fully recyclable and reusable too. Why Choose Hybrid Herbs Matcha Green Tea? How Do I Use Matcha Green Tea? Our powder has a delicate and smooth taste which is best enjoyed without adding any milk, sugar and spices. Simply place 1/4 to 1/2 teaspoon of the vibrant green powder into hot (but never boiling) water, then whisk with a mini kitchen whisk or a traditional Japanese bamboo whisk called a chasen to create a silky, frothy beverage. Matcha can also be added to other culinary creations such as ice creams, juices, smoothies, tonics, energy bars and raw chocolate recipes. Ingredients: Organic Matcha Green Tea Powder - Ceremonial Grade from Uji in Japan. 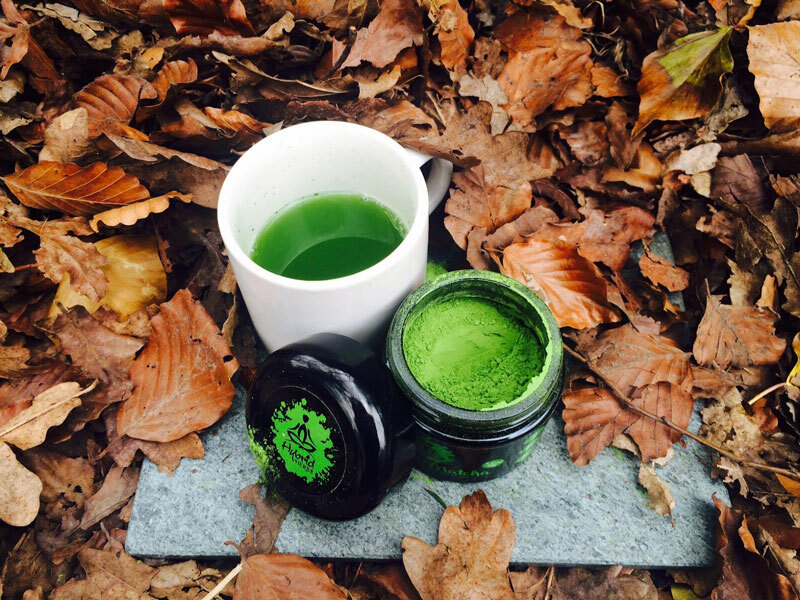 "The colour of the powder is like no other tea I've ever seen before"
"When I first opened the package...I was happy to see that promised bright green color and to smell a refreshing, clean matcha scent – both good signs that signal freshness and high quality. It tastes great, too! "I really love this product. The morning after it arrived I made a Matcha latte with Rude Healh almond milk, and it was divine"
"I've been using Matcha religiously for over 4 years now. Hybrid Herbs Matcha Tea has blown me away. My job is very demanding and this Matcha has kept me going through the toughest of times. I feel very focused and driven, with a real lift in my mood. I was surprised how Green it was. Most Matcha I have tried have have been very pale in comparison. I often find, the more I take throughout the day, the better I sleep too. It also has a very calming effect on me. So great to have found such a good quality Matcha Green Tea. Well happy!" I have purchased this tea 3 times and very pleased with the quality. This matcha is the best that has passed these lips and have recommended it to many other friends who agree. You can tell upon opening it that it's special with its intense bright green colour. Love to partake with a half a teaspoon around noon whisked up into a holy froth. It's intensity is beautiful and love the way it does not pull on the nervous system like coffee does yet brings the same clarity, focus and aliveness. 5 STARS!! Once again from the HybridHerbs team. THE best usucha matcha I ever tasted! various sources in Germany and my country, Romania. I accidentally came accross the Hybrid Herbs shop online and gave it a go: wow! In terms of usucha (thin matcha tea) this one is absolutely the best! Although not suitable for koicha (thick ceremony matcha) the quality of this product is outstanding and simply leaves no room for another variety! Best price for the quality, really low cost transportation (I order it in Romania about twice a year in 200g jars) and great customer experience! Congrats guys! This is without doubt the best Matcha tea i have ever tasted; and, as with any of the products in the Hybrid Herbs range (and i think i've nearly tried them all!! ), it is of superior quality... Think you've tried Matcha tea(?? ), well think again; you ain't tried anything until you try this - absolutely the best there is on the market; well worth the price - highly recommended; you will not be disappointed!! Really green and high quality matcha.I enjoy the taste! Recommend you. 100g of Match comes in a splendid black glass jar that is worth keeping just for a jar. But this black jar seals in the goodness and keeps the tea fresh and vibrant green. The colour is as advertised and vibrant green, and the tea is fresh like cut grass. In the cup green tea does not get any greener than this. A very nice fresh taste and I feel I have done my healthy bit for the day after I drink it. I use a battery powered electric coffee stirrer to whisk the tea in the cup, and it froths up nicely and holds the froth till the end. There are no bits so no complaints and I recommend it, however it is overly expensive. This is the best matcha that I've ever had, totally recommend it, the ONLY matcha I found to be shipped in dark glass jars, no aluminum, plastic etc. Plus the guys are so fast and kind. 100% worth it! I really enjoy HH matcha. It's definitely the best value in terms of a good quality matcha I have found. I tend to use 65/70 degree water when making hot to avoid any bitterness. My favourite use for HH matcha is to make a cold brew with ice. The flavours really come to the fore when drunk cold.